If there’s a definition of an original-style hot rodder, Frank Agueci must surely fit it. From the time he was a teenager, there was grease under his fingernails and a wrench in his pocket. His garage is still filled with cars, although $60 ones are no longer in the picture. He currently owns a 1925 Dodge Brothers sedan, a 1938 LaSalle powered by a 1995 Cadillac engine, 1931 Oldsmobile, 1939 Cadillac Series 61 sedan, 1989 Jaguar XJS 12-cylinder convertible, and 1997 Camaro Z28 30th Anniversary Edition. He shares it all with his wife Yvonne and they have two children, Jane and John. 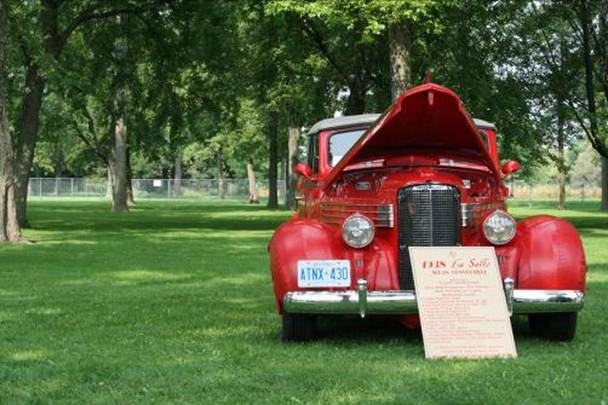 From about 1964 he belonged to the Canadian Motor Club, a Toronto-based group of some 30 members that was directly sponsored by the Scarborough Parks and Recreation Department. They met at an old car dealership and hosted a small indoor show, “but we didn’t have money to buy two candles,” Frank laughs. “We had electricians who were in the club so they dropped lights down from the ceiling.” He stayed with the club until 1977 when he was transferred to Calgary and Edmonton, and didn’t join any club when he returned to Ontario. Frank approached GM about holding the show on the company’s grounds and was initially met with scepticism. “They weren’t sure because of the mess and liability,” he says. “But after going back about three times, Stew Low at GM said, ‘You can have the property, but don’t ask me for anything else.’ After our first show, which was about 400 cars, we left the place spotless. He phoned me on Monday morning and couldn’t believe that the place looked like nothing had happened on the weekend. From then on, we had a very good relationship for thirteen years. Frank wasn’t a member of the club during that first show, but joined in 1995. He has since retired from GM and is self-employed, and he and Yvonne like to “disappear” to their cottage north of Campbellford on weekends, and take one or two cruises each year. But the club is still important, as is the work he does each year for Autofest. “Nobody thought there’d be a second or a third one, and by the time we got to number five we said we should pack it in, it’s too much work. Then, at ten, we said ‘here we are,’ and by 15 years we have much more space and a much better facility.